Urban heat island effect is a major issue in metropolitan Phoenix, and South Mountain Community College’s (SMCC) campus is no exception. With temperatures in excess of 100 degrees Fahrenheit well into the Fall semester and at the end of Spring semester, students are regularly exposed to extreme heat conditions. There are areas on campus that are more exposed than others; SMCC decided to focus mitigation efforts on one area of campus that is heavily trafficked and particularly exposed to extreme heat. 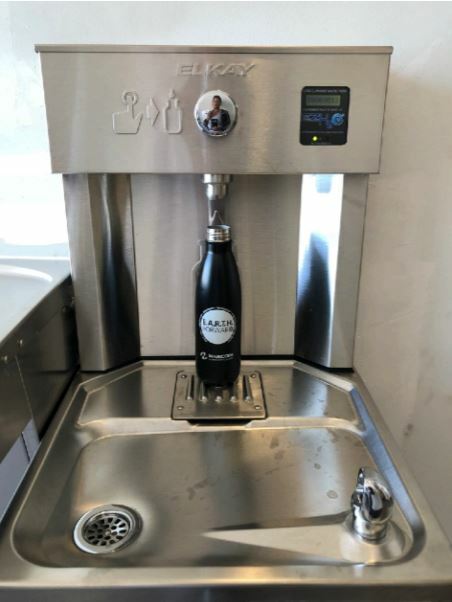 The Facilities Department had existing plans to install a water filling station (a drinking fountain with a water bottle filling option) but had not implemented the project. The SMCC Sustainability Committee decided to add momentum to this effort, and helped get the water filling station installed. The Office of Sustainability for Maricopa County Community Colleges District along with the Sustainability Committee for SMCC initiated this project, while the Facilities Department at SMCC installed the unit. Funds for the water filling station were allocated from an existing external grant for Campus-Community Resilience Projects. In completing a campus-community resilience assessment, SMCC identified extreme heat and urban heat island effect as a top climate hazard. Further, SMCC approached the assessment with the assumption that they would focus more on individual capacity to deal with extreme heat, and less on large scale infrastructure. This led to the creation of a Community Heat Resilience Survey that was distributed to SMCC students. The data collected here indicated, among other things, that many students had experienced symptoms of heat related illness to some degree and were unaware of existing resources to mitigate and cope with such instances. From this data, SMCC initiated the water filling station project. The original idea to address extreme heat in this section of campus was to install a shade structure for students. However, as SMCC progressed with the idea and consulted with companies it became apparent that the vision would not be feasible given financial constraints. The Facilities Department suggested a water filling station as a useful alternative. SMCC also initiated a Community Resilience Ambassador Workshop to educate students on existing resources for extreme heat and encourage them to be resilience ambassadors for their peers. Through water monitoring technology, SMCC’s Facilities Department is collecting data on the use of the water filling station. The Community Heat Resilience Survey will also be re-administered periodically to provide more general data on extreme heat exposure and students’ capacity to cope with it.